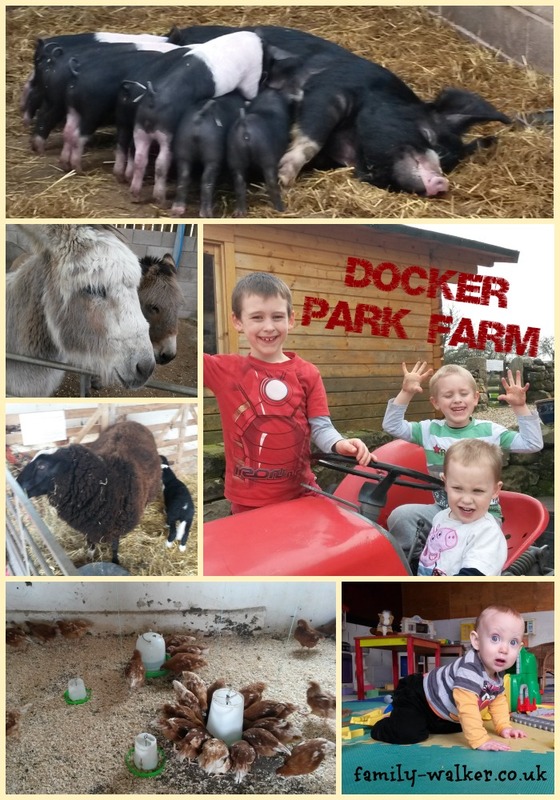 My Mum came to visit today so we gave my Hubs the day off and took the Boys out to Docker Park Farm. They have been itching to get back here since it closed for the winter and almost exploded when I told them it was open again now the Easter Holidays had started. This is the first time that Freddie has been big enough to play properly while we've been visiting. OK... He's a bit little for the tractors and the hay barn, but the lovely padded floor of the Under 5's play barn was just perfect for him, and really well kitted out with toys and games. He had an awesome time. So much fun that all three of his big brothers just HAD to come and join him (even though Jack is technically too old for that bit of the play barn). Nana treated us all to a yummy lunch in the Cafe, and bought a couple of cracking hot chocolates too. The kids stuffed their faces on crispy cake tray bake - massive ones bursting with marshmallows! So glad this place is open for the new season!